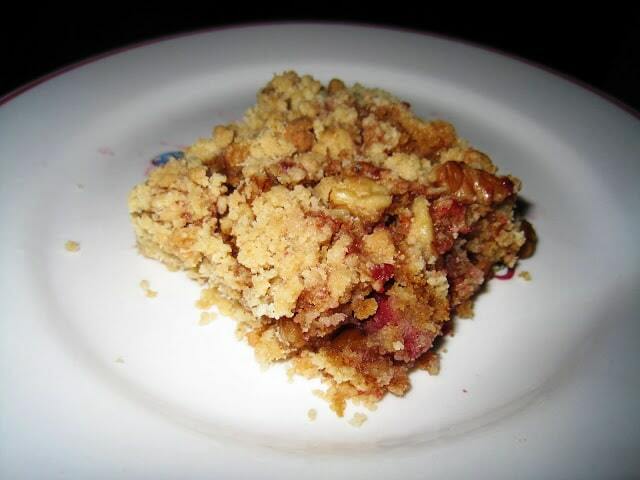 Fruit topped with a crumbly cake mixture and baked…one of my favorite ways to enjoy fruit baked into a dessert! This recipe was inspired by a co-worker who had brought in something similar and wanted to recreate it at home. Although this recipe isn’t entirely made from scratch, it’s very good and extremely easy to prepare. It tastes great warm or cold, and with or without vanilla ice cream. It’s a great dessert to take to any dinner party or have at home. 2. Melt the butter in a bowl. 3. In a separate larger mixing bowl, combine the yellow cake mix and chopped walnuts. 3. Gently mix in the butter spoons at a time. Using your hands mix the butter and cake mix as you add the butter. The end product should be crumbly (not doughy). 4. In a 9×13″ glass pan, evenly spread the bag of frozen fruit. 5. Crumble the batter on top evenly so that the raspberry layer is completely covered. 6. Bake for 30 minutes until the top is slightly golden brown. 7. Serve hot or cold. This dessert goes well with vanilla ice cream. Thank you so much for letting me know - I actually had no idea Betty Crocker Yellow Cake mix used animal fats - i'll have to check next time i'm at the grocery store. Thanks again for the info! I was looking on the box for Betty Crocker yellow cake mix and did not find the source of animal fats on the ingredients list...i may have missed something - so if you can, let me know exactly what i should be looking for so i know. Thank you!